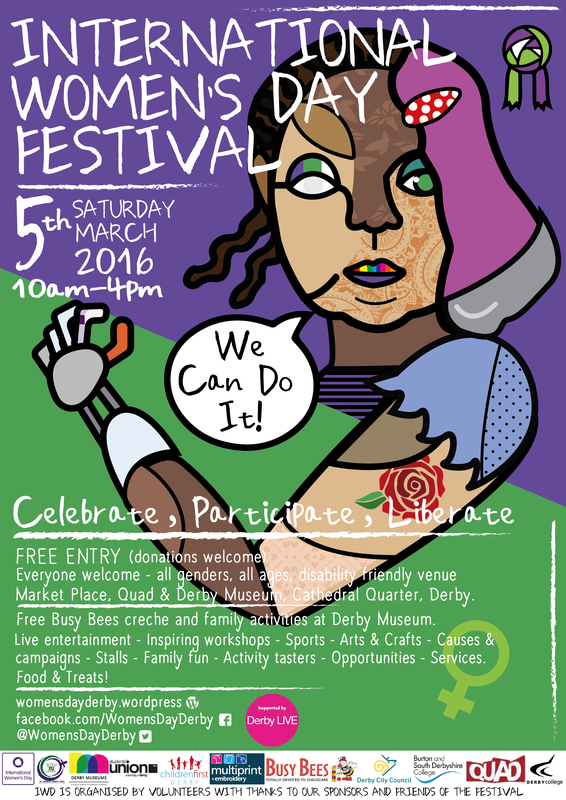 Join us for Derby’s International Women’s Day Festival, Saturday 5th March 2016, 10am-4pm at the Market Place (marquee) & QUAD & Derby Museum, Cathedral Quarter, Derby city centre. Busy Bees Heatherton is kindly offering a free crèche (donations welcome) on the day at Derby Museum, The Strand – Call Kelly at Busy Bees Heatherton on 01332 518888 to book crèche places in advance. The Museum is also offering creative family fun. FREE entry to the festival – please make a donation if you can – the festival is organised entirely by volunteers in their spare time – by the community for the community. * Network with 40+ exhibitors including local charities, businesses, educators, public services, artists, community groups and campaigns for women & girls worldwide. * Engage with hundreds of festival visitors. * Reach a diverse multicultural audience. * Run activities, e.g. taster sessions, consultations, pampering, fundraising, arts & crafts, science or cultural awareness activities. * Promote your services/projects and raise awareness in a great atmosphere of community spirit. * Recruit new staff or volunteers. * Catch the eye of passers-by on a busy Saturday in the city centre. * Show your support for gender equality and help us inspire the next generation of girls in our city and promote all the great local charities and support available to create a brighter, healthier, safer and fairer future for women and girls. * Enjoy a day of live entertainment, stereotype-busting sports, multicultural arts, community spirit, great causes and inspiring speakers.